Gas for coal plant switching drove a recovery in European gas demand in 2016. Forward fuel prices indicate further switching potential in 2017 and 2018. The switching of gas for coal fired power plants was one of the key themes in European energy markets in 2016. Switching drove a 20 bcma recovery in power sector gas demand last year. This reversed the downtrend in European gas demand across the previous five years. A year ago we looked at the relative fuel price dynamics driving switching in the UK and on the Continent, foreshadowing significant switching potential as the year progressed. In today’s article we look at the current forward market switching boundaries, to provide an insight into how switching may evolve in 2017 and 2018. Switching happens first in the UK power market because of the UK carbon price floor. This additional 18 £/t variable cost imposed on coal plant supports switching from coal to CCGT plants at higher gas price levels than in Continental European power markets. This is illustrated by the fact that the UK accounted for almost half of additional power sector gas burn in 2016. Chart 1 shows switching boundaries in the UK power market at current forward price levels for gas, coal and carbon. The chart shows whether current forward market fuel prices favour gas or coal burn. The coloured dots represent different combinations of gas and coal prices for seasonal forward contracts over the next three seasons (Sum 17 to Sum 18). The diagonal lines show the baseload switching boundaries for CCGT plants of different efficiencies (a 52% new plant through to a 47% 1990s plant). In simple terms, if the dots sit below the diagonal switching lines then market prices favour gas burn. If the dots sit above the switching boundaries they favour coal burn. 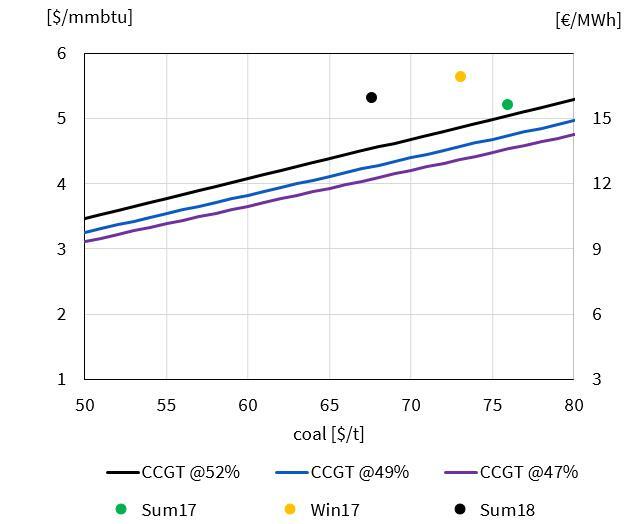 It can be seen from Chart 1 that CCGTs now have a structural variable cost advantage over coal in the UK. This advantage is more pronounced in summer, given seasonally lower gas prices. But it is also sustained across the winter. 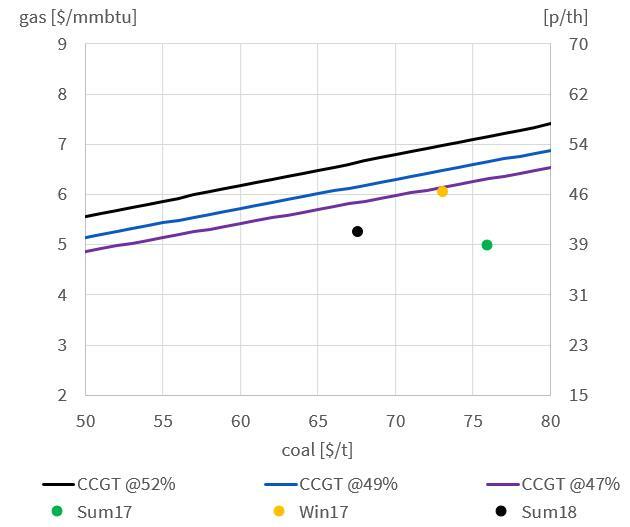 With the carbon price floor in place, UK coal plant are effectively providing peaking capacity, with the influence of coal units on peak prices driving an increase in CCGT margin rents. Germany has the lowest power prices of the major European power markets (excluding the hydro dominated Nordpool markets). This is due to a combination of relatively low variable cost coal/lignite capacity and high renewable penetration. In this environment, CCGTs have been structurally out of merit for most of the last five years. Germany is Europe’s toughest major market for switching. There is no carbon price support like in the UK. Germany is also well interconnected to allow imports of hydro flexibility from Nordpool and the Alpine markets. But most importantly, the German fleet of coal plants has relatively high efficiency levels. Despite this, significant switching occurred in the German market in summer 2016 given seasonal weakness in hub prices. Chart 2 shows that the German switching boundary is not too far away for current Summer 2017 fuel prices (the green dot). It is important to note that the switching boundaries shown in Chart 2 are for older 36% efficient coal plants, the first to be displaced by CCGTs as gas prices fall relative to coal. The efficiency of German power plants range from the 36% level up to around 45% for the newest stations built this decade. These new coal stations require a more significant decline in gas prices (~3 €/MWh) to be displaced by newer CCGTs. That said, the 36% German switching boundary is a useful benchmark to signal switching potential across other Continental European power markets. If switching is taking place in Germany, it will also be happening in other key markets e.g. Italy, France and the Netherlands. European spot coal prices have remained stubbornly above 70 $/t this year (currently around 75 $/t), despite strong backwardation in the coal forward curve. Gas hub prices on the other hand have been weakening into the summer as a result of unseasonably warm weather and robust LNG import volumes. The behaviour of European gas prices across this summer will be an important barometer for 2017 power sector switching dynamics. If gas prices continue to decline, e.g. another 1 to 2 €/MWh relative to current levels, this will likely trigger significant switching across European power markets. The path of gas hub prices across the remainder of 2017 will be strongly driven by European LNG import volumes. Cargo flows into Europe have been steadily rising this year as global supply grows and Asian LNG demand weakens into the summer. If LNG imports continue to rise, power sector switching will be the primary mechanism that allows European hubs to absorb more gas.